For many learner drivers clutch control can be a real challenge. While some are lucky enough to grasp it right away, for the majority of new drivers mastering their clutch control is an infuriating struggle to keep the car from stalling every time they want to stop, start, or just pull away from some traffic lights. In very simple terms, a clutch is two connected metal plates which are separated when you depress the clutch pedal. When you depress the pedal and separate the plates, you separate the engine from the wheels, which in turn stops power from passing to your wheels. As your car’s engine is always turning over, it’s power is always being transmitted to the wheels, as long as the car is in gear. If you forget to depress the clutch when you stop, your engine continues to try and send power to your stationary wheels and your car will stall. If you try and pull away without using the clutch at the right time, not enough power makes it through to your wheels and the car stalls. As you release the clutch pedal, the plates in the engine are allowed to touch and start to lock together. The ‘biting point’ is when the plates touch and start to transfer power from the engine to the wheels. When the pedal has been fully released the plates lock together and transfer the full power of the engine. Mastering clutch control is a vital part of being able to control your car at lower speeds and makes maneuvers such as reversing and parking much easier. Learning you clutch just requires a quiet road and a bit of patience. 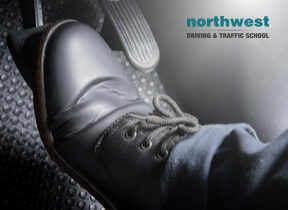 Clutch control in one of the things our expert instructors here at Northwest will help you learn during your driving lessons. If you want to practice it yourself, just find a safe place and an appropriate co-driver. The first step on the road to mastering your clutch control is learning how to find the bite point. Here are a few steps you can follow while you are practicing. ● Find a safe, quiet and flat practice area. ● Ensure the car is properly set up for you. ● Get your seatbelt on, turn on the engine and release the handbrake. ● Depress the clutch all the way and put the car into first gear. ● Give the accelerator a gentle nudge, aiming to get the rev counter to somewhere around 1500rpm. ● Make sure it’s safe to move and, if it is, very slowly raise your foot off the clutch. ● Eventually, the clutch plates will begin to touch and the car will slowly move forward. ● You’ve found your bite point! Repeat steps 4-7 until you’re comfortable with the position of the bite point. Once you’ve got the hang of your car’s bite point, the next step is learning how to slip the clutch. Slipping the clutch is an essential skill you’ll need to learn in order to smoothly complete maneuvers such as reverse parking or three-point turns. Luckily, learning how to slip your clutch isn’t that difficult. ● To practice slipping your clutch, first find the bite point and let your vehicle move forward slowly. ● Try to control the speed of the vehicle with slight adjustments to the clutch; depress it by a centimeter or so to slow down and release it a similar amount to speed up. ● While you’re trying not to crack whatever you are imagining is under your clutch pedal, maintain gentle pressure on the accelerator. Don’t be tempted to try and use it to speed up and slow down, use the clutch instead. ● Once you’ve repeated this little exercise a few times, clutch control will become second nature and you’ll be ready to tackle those trick three-point turns.